Wisconsin governor kicks off his 2016 presidential bid by ordering homestate dissenters arrested and ticketed—for singing. 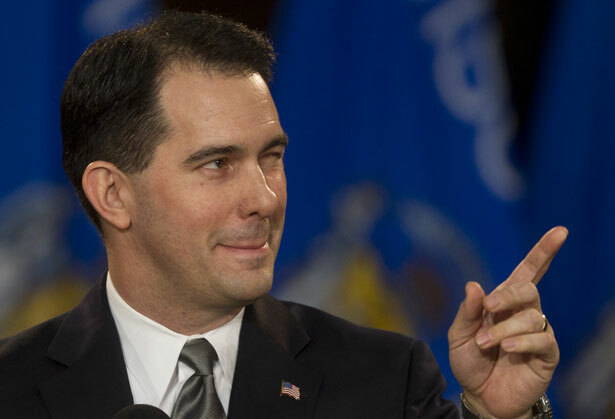 Wisconsin Governor Scott Walker is an exceptionally ambitious career politician who loves the sound of cheering crowds in the presidential primary states where he hopes to be a 2016 contender. But he’s does not care for the sound of dissent. In fact, dissident voices bother the conservative Republican governor so much that he has ordered state police forces to begin arresting Wisconsinites—from 85-year-olds to young moms with kids—who dare to join a long-established noontime “Solidarity Sing Along” at the state capitol in Madison. In this summer of protest, crowds have gathered at state capitols nationwide—from women’s rights activists in Austin to “Stand Your Ground” foes in Tallahassee to voting rights champions in Raleigh. There have been mass arrests, especially during the “Moral Monday” protests in North Carolina. But Walker has distinguished himself by targeting tunes. The singing, which traces its roots to the mass protests against Walker’s anti-labor initiatives of February and March 2011, has been a steady presence in the capitol for two years. But, this summer, the governor’s cracking down. So far, seventy-nine Wisconsinites have been arrested and ticketed, and dozens more are likely to face charges for singing songs like “Which Side Are You On?” and “On Wisconsin” without following a new set of permitting rules developed by the governor to limit the right to assemble. It is hard to understand why the governor is so perturbed. He’s not often in a position to hear what’s going on in the capitol. Unless, of course, the voices of the singers are loud enough to carry to states like Alabama. But before he distributes the bumper stickers, Walker is spending his off-year summer vacation on the partisan dinner circuit. When seventeen singers were arrested Friday at the state capitol, Walker was in Denver keynoting the fourth annual Western Conservative Summit. Soon he’ll be off to Alabama for the annual Republican Party summer dinner. He’s already been to the first primary state of New Hampshire and the first caucus state of Iowa. Walker’s certainly seems to be running. But he’s not getting much traction. Against prospective Republican contenders, according to a new TheRun2016 poll, Walker finished eighth with 2.1 percent support among possible Iowa Republican Caucus participants. There are a lot of explanations for why Governor Walker, despite a very high national profile, attracts so little support. But some of the burden the governor carries undoubtedly has to do with his image as a “divide and conquer” politician who is determined to crack down on teachers, public employees, conservationists, local officials and anyone else who isn’t using his songbook—even going so far as to have grandmothers, veterans, teachers and mothers with children arrested for carrying a tune in the capitol—but who is not very good when it comes to managing his state, maintaining great schools, building a strong infrastructure or creating a climate that encourages job creation. Congressman Darrell Issa has a plan to end the US Postal Service. Can the American Postal Workers Union stop him?